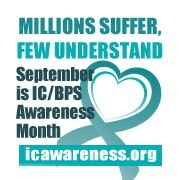 Interstitial cystitis is a chronic condition, also called Bladder Pain Syndrome (BPS), which most commonly affects women. It is important to 180 Medical to provide support and education to our customers with Interstitial Cystitis. Interstitial cystitis (IC) causes the walls of your bladder become irritated and inflamed. The symptoms include discomfort, pressure, tenderness or intense pain in the bladder and pelvis. Interstitial Cystitis can also cause urgency and frequency of urination. People with severe cases of IC/PBS can urinate up to 60 times per day. Interstitial Cystitis varies on the intensity of symptoms and can go into remission. Pentosan (Elmiron), the only oral drug approved by the Food and Drug Administration specifically for Interstitial Cystitis. It may restore the inner surface of the bladder. For more information, visit the Interstitial Cystitis Association.